I don’t know about y’all, but my toys mate and multiply almost as quickly as people in my house! With five kids, the toy closet in our gameroom had spun completely out of control. We were constantly reminding the kids where all the toys went, even though most bins were labeled. Inevitably, toys ended up crammed in random spaces or piled on the floor. A lot of good all those shelves did. With the start of school looming around the corner, I knew I needed to take action and get a better system. This closet was stressing me out and the kids were complaining way too much about how they couldn’t find anything. 1) Found lost toy souls and reunited them with their original owner. 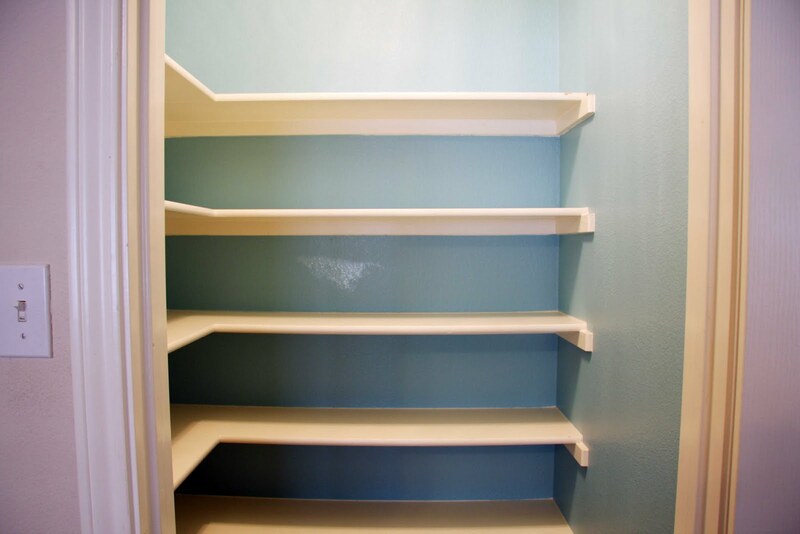 A clean slate makes it so much easier to really reevaluate just what you want to put back in the space. After we trashed, donated and reunited, then I started sorting the “keep” toys by category (blocks, educational, dress-up clothes, cars/trucks, Barbie, etc.) 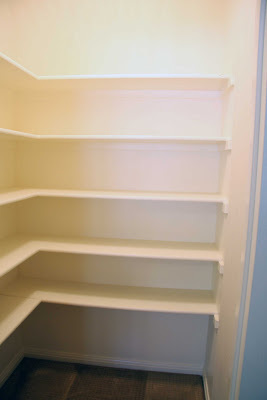 Then, I measured each shelf (length, width and height). My oldest and I grabbed the tape measure and headed out the door to Target. 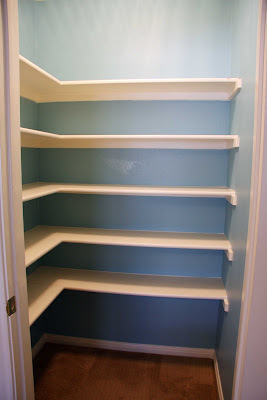 But, not before ever-so-kindly asking my husband to paint the closet. Aqua. He shook his head and said, “Ok.” But I knew he thought I was off my rocker. 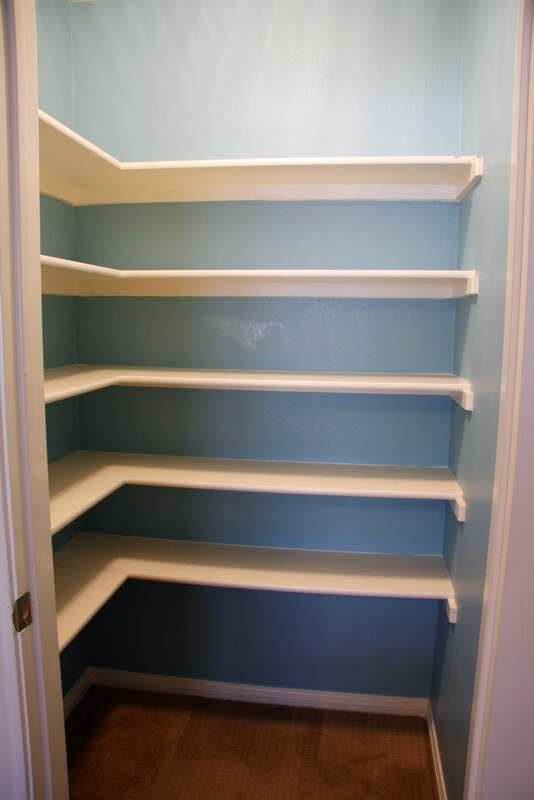 We had half a gallon left over from our laundry room paint job and I just thought it would be a way fun color for such a way fun closet. Plus, it was FREE. When we returned, this is what I saw. Feast your eyes!! 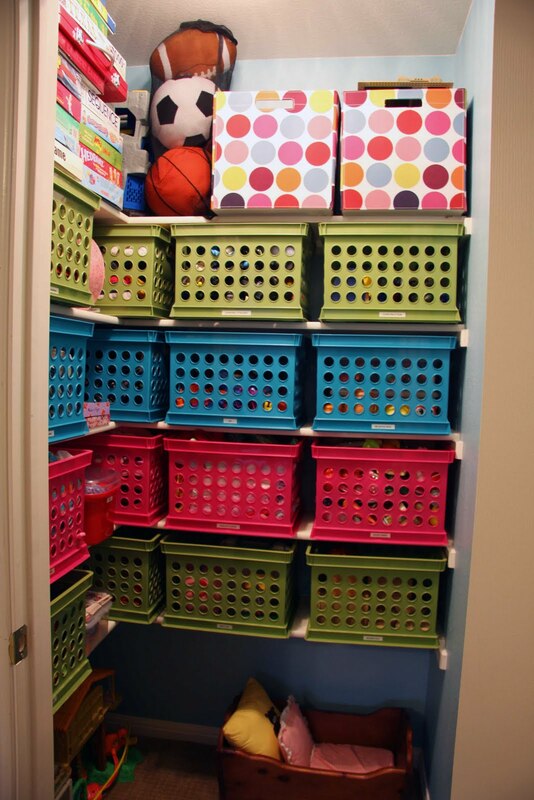 Hi fun closet. I wish I could say the whole “paint your closet a fun color” was my idea, but I was really inspired by House of Smiths and iHeartOrganizing. 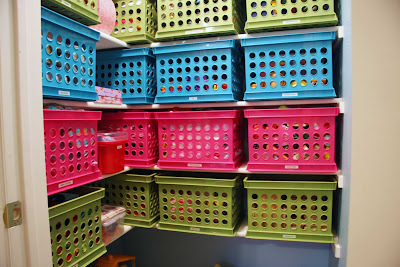 Will and I scored some great colorful crates on SALE at Target. 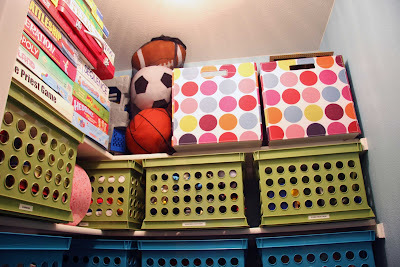 Note to self: shopping for storage containers in August brings great sales as kids head back to school and college. We love it – $75 well spent! 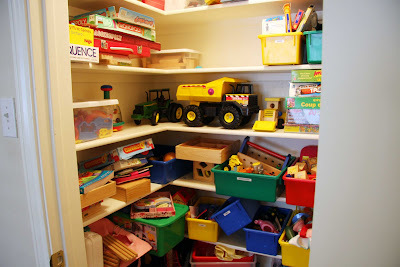 It looks great, but I was wondering if you have a dedicated play space where you can keep the toys? 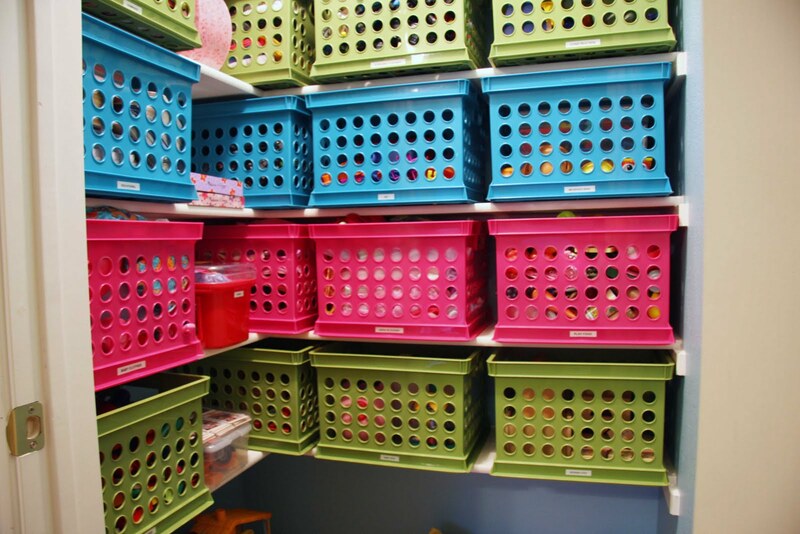 We have tons of organized bins and a large storage piece of furniture in our playroom. 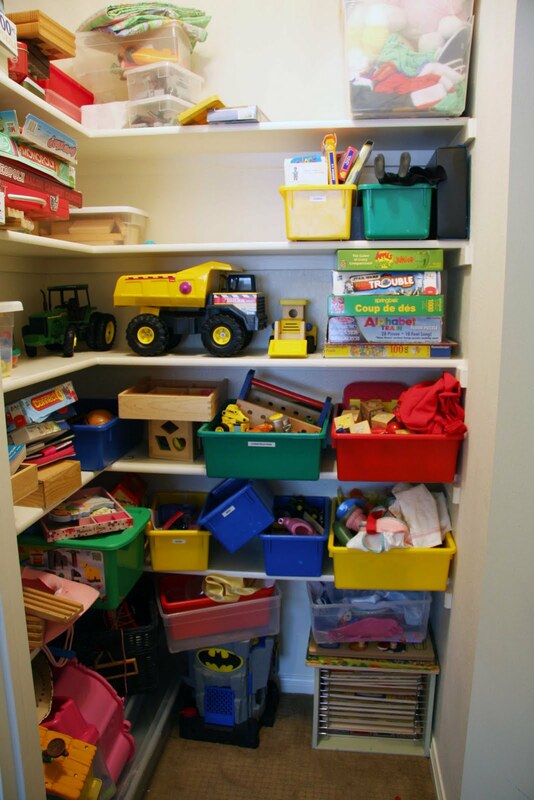 I find it is easier to keep the toys out in the open where the kids can get to them as opposed to in a closet. I know Moms today don't want to look at the toys, but my kids are able to put them away and take them out without any assistance. Our gameroom is a large area, but it seemed silly to buy a storage unit for the toys, when we had a perfectly good closet to use! We do have a train table in the room that houses all those toys and we have a media center with baskets that store Wii games, remotes, etc. 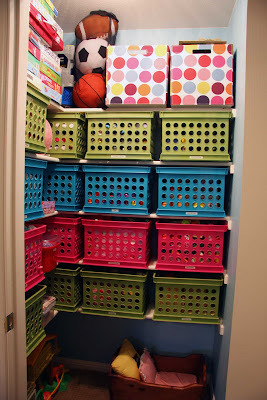 The bins in the closet are arranged in height by age, so they can reach the toys they can play with, with the exception of board games and legos. With littles in the house, the legos don't stay out all the time. Too dangerous. The same goes for board games. Those are usually a family event anyway. This system works great for us! Great idea on the height arrangement. Glad you have a dedicated play space. There are so many families these days who keep the toys to a minimum, and I find them essential for learning. Kids just need to be kids a little longer! Wow, looks great! 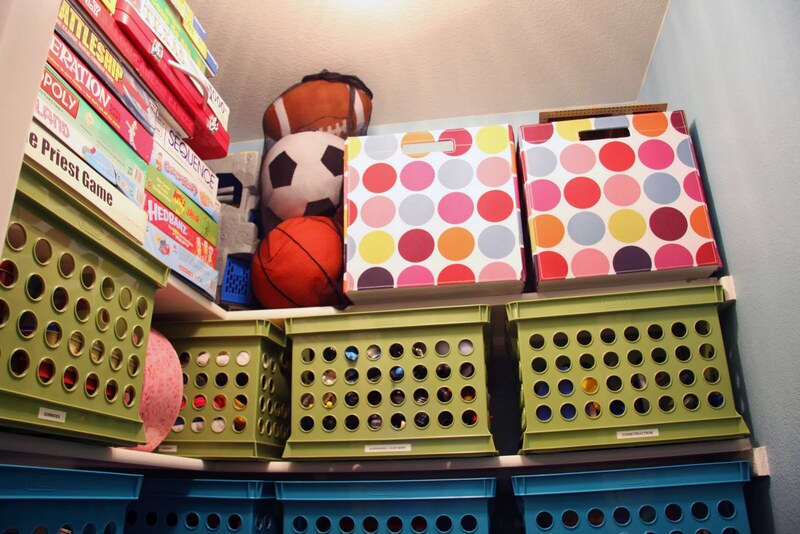 There is nothing I love more than getting something really well organized.